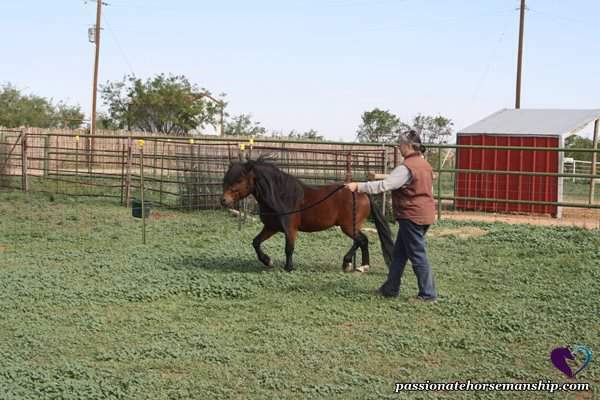 Groundwork is a very important part of the training process in using the Passionate Horsemanship methods. It can be used for young as well as older horses, trained or untrained. I always start a horses training with groundwork no matter how much training they’ve had. With young horses, you can teach them a lot from the ground and with older ones you can get clarity on what they already know and help the senior horse that is stiff. It’s also great for horses that can’t be ridden and for ponies too. Groundwork is a great way to see what is going on with your horse before you ride. Well, that depends on the horse. Horses like humans learn at different paces, some learn quickly while others it takes awhile. You have to go at the horses’ pace so that they can learn what is being asked of them. If you push them you’ll wind up with a hole in your training and it will show up somewhere else. bored. It’s best to mix things up, add obstacles and up the degree of difficulty as the horse learns. 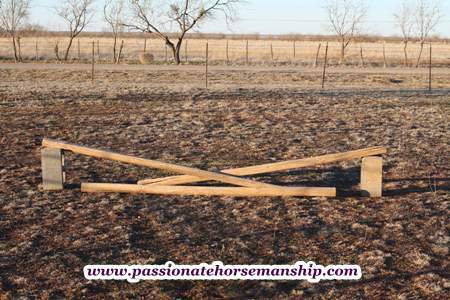 Horse Agility is a great way to help your horse on the ground no matter the discipline. When you’re doing groundwork think about the way it will translate to you being on their back. If you allow them to act up on the ground chances are they will act up when being ridden. If they don’t respect you on the ground they won’t respect you on their back. With groundwork, you can teach your horse to backup, stop, go forward, sidepass, neck rein, turn on the haunches, turn on the forequarters and more. Groundwork allows you to teach the physical aids you’ll need when you’re mounted. From the ground you can also teach them how to move in balance which will help to carry you when you’re mounted (I love Straightness Training). The groundwork will help you to see what your horse is actually doing instead of trying to feel the motion when you are in the saddle. I’ve found that training horses through groundwork allows them to understand what you are asking of them without having to worry about balancing you on their back or tugging at the reins. Once they understand the task on the ground it’s much easier for them to understand when you are on their back, therefore you will experience less conflict and confusion. Most riders are more in balance when on the ground. When riding if something goes wrong most of the time we are worried about our balance and trying to stay in the saddle, this can cause the horse confusion because of the conflicting signals we send them. Ground driving is another form of groundwork that is very beneficial and is great for a horse you want to start or restart under saddle. I hope you take away from this how powerful groundwork can be and to slow down and take the time the horse needs to really learn what you are asking of them from the ground. If you take the time to do the groundwork you will take your riding to a whole new level. Contact me and let me help you get started with your horse’s groundwork.